These kinds of programs are rare, as investing in young, relatively inexperienced people is risky. Krainer’s story makes us question what we’re risking by not investing in more young, dedicated, passionate scientists. Although no one knew it years ago, we can say today that dramatic improvements in the lives of children suffering from a deadly disease called spinal muscular atrophy stood to be affected by Krainer’s career. Research from his lab has contributed significantly to the development of what promises to be the first drug therapy for this disease, if an application now before the FDA is approved. AA: Hey, I’m Andrea Alfano. BS: And I’m Brian Stallard. AA: And this is Base Pairs, the podcast about the power of genetic information. But this episode is a little different from the others we’ve done. We wanted to give you listeners a better sense of what it’s like to sit down and talk with one of these amazing scientists—you’ll see what I mean. BS: Last time, we talked about how that power can help save lives by enabling us to produce more food, which we’re really going to need as the human population continues to grow. But Andrea, you’ve been talking to someone who has seen how genetic information can save lives in a much more direct way. AA: I have. It’s amazing. BS: Now, I would think that has something to do with detecting harmful mutations, or identifying genetic disease, so that doctors know which treatment to give. AA: That’s right. But. There’s more. AA: A lot more. This is not like anything you’ve heard of before, because there has never been a treatment like this. And this treatment is only possible because of basic research on how our cells use the information stored within our DNA. It’s not an approved treatment yet—applications will soon be filed with regulators in the US, Europe and Japan. But, we can say for sure that there are babies who have received this drug who were unlikely to live past age two, and they are now four years old. BS: That’s incredible! So this scientist you’ve been talking with, the guy who did much of the basic research behind this new medicine, that’s Professor Adrian Krainer right? He just celebrated 30 years of working at CSHL this year, and when he started working here, he had never even heard about this disease that kills infants,. Like a lot of our scientists, he was MUCH more focused on that timeless pursuit of new knowledge about biology—fundamental stuff. AA: Yeah, so I wanted to know how that happens. How do you go from studying broad, basic processes in biology to helping save the lives of very real people with a particular disease? For Adrian, it meant going way back. AK: I think that—well, I was motivated to go into biology around high school. I was interested in genetics when I first was exposed to classical genetics, Mendelian genetics, I thought it was extremely interesting. I had a lot of fun with it. AK: So Mendel—So Gregor Mendel was an Austrian monk and he was doing experiments with peas and other plants and he discovered how traits are passed from one generation to the next and he showed some rules for it—dominance and recessive—the types of traits and the manner in which they are inherited. So I had a lot of fun with that topic and I thought that I should go into it and do research. So I grew up in Uruguay, in South America, and so that’s where I went to high school, and that interest in science and research prompted me to come to the U.S. to study. AA: So you always—you kind of started out wanting to do basic research in particular? AK: Yeah, to the extent that I understood what that consisted of. And uh, at Columbia I majored in biochemistry. And then I did my PhD in biochemistry at Harvard, that’s when I started to study RNA splicing and because of the research that I did I always maintained a close link between the new basic knowledge we were gaining and the relevance to genetic diseases. I feel that I do a kind of genetics, or molecular genetics, so I didn’t deviate too much from what I had in mind when I went into college. Now of course I didn’t even know that splicing existed then. BS: Splicing. I just learned about this recently. It’s a very strange process. I think the fact that I produce this podcast actually really helped me to understand how it works, because the kind of splicing that Adrian studies—splicing together bits of molecules that carry genetic information in the cell—is like the kind of splicing that I do to put together the bits of audio in this podcast. AA: You know, you’re right—it is similar. BS: So from my understanding, splicing goes like this: You have your DNA, which contains the information in all of your genes. But for gene to do its job, the cell first makes a copy of that information in the form of RNA. RNA is a molecule that’s related to DNA, but it’s better suited to editing. It’s like when I copy and convert an audio file from, say, an mp3 file to a WAV file. Same information, different format. AA: Right, and it’s for editing purposes that the cell makes this RNA copy. BS: Yes. Once the DNA sequence is copied in the different “format” of RNA, there are extra bits of sequence that need to be edited out—meaningless gibberish. It’s like when I edit out sections of audio that aren’t relevant to our story. AA: At first the RNA sequence of a gene is like a raw recording that still has a bunch of outtakes. BS: Right. I use an audio editing program to cut those out and then splice together the bits that we need – but only those bits. The cell’s equivalent of such an editing program is an amazing piece of molecular machinery called the spliceosome, which removes the bits of sequence that are mucking up the “message.” This machine pastes together the bits of sequence containing the instructions for making a protein. AA: Yeah, and those sequences that are mucking up the message – you can think of them as “interfering” sequences. And that’s why biologists called them introns. Those get spliced away. In the same vein, the sequences that get expressed to the cell’s protein factories are called exons. Those get stitched together to form the gene’s fully edited RNA message. BS: So at the end of the process, you get a sequence of letters that make a coherent message. Or in our analogy, a podcast that you’ll understand. AA: This is the process that we’re talking about when we say “splicing.” A co-discoverer of splicing, Rich Roberts, actually worked here at CSHL. He and Philip Sharp of MIT simultaneously discovered splicing in 1977, and later shared a Nobel Prize. Ok, back to Adrian—and our story of how an amazing drug for very sick children was invented. AK: The work that I did as a Ph.D. student was to develop a system to study the biochemistry of RNA splicing. So we were able to get RNA splicing to happen in the test tube, using extracts from cell nuclei. AA: So you got to meet Rich Roberts when you came here, right? AK: Yeah, so actually we met in 1985. So I came to Cold Spring Harbor in 1986, so in ’84 however I gave a talk at the RNA Processing meeting here when I was still a graduate student. So that’s how Rich knew about my work, through that presentation I gave. AA: And Rich Roberts is one of the scientists who won the Nobel Prize. AK: Yeah, so Roberts and Sharp won the Nobel Prize later in 1993. So it was a landmark discovery and a paradigm shift. And so Rich went to that meeting and that’s when he suggested to me to come here as a Cold Spring Harbor Fellow. And so eventually I came here—30 years ago, in July of 1986. AA: And you were actually the first fellow, right? Or one of them. AK: Yes, that’s right. I was the first fellow. So the idea is to bring a young scientist, straight after the Ph.D. and let them function independently and sink or swim on their own. And generally they have a mentor, and so Rich Roberts was my mentor. RR: Jim and I don’t know whether Joe, but some people anyway, decided that we would have a program for really good post-docs and call them Junior Fellows in exactly the system that they have at Harvard. BS: That’s Rich Roberts himself, Nobel Prize-winner and co-discoverer of splicing. RR: You find really good people and you pretend that they are very special. You bring them in and give them some extra money and resources and so on. I thought Adrian would be perfect for this. We could bring him in under that auspice. He could work in conjunction with my lab, be independent, do whatever he wants to do. I kind of like it when people in my lab do what they want to do rather than what I tell them to do. It was perfect. I met Adrian, convinced him to do it. The rest is history, as they say. AA: History, indeed. But when I talked to Adrian I learned that if it weren’t for this Fellows program, that history could have been very, very different—for Adrian, and especially for those kids who are alive today because of the drug that came out of his research. AK: If I went and did a standard postdoc somewhere, I probably would have switched to something completely different and I was very attached to this work. AA: What was it about this that made you so interested in splicing? Like, was it that it was such a puzzle to figure out? AA: What was it like to figure out in a test tube what all of these little—machines, basically, are that are in your cells all the time? AK: It’s like solving a puzzle, so it’s very rewarding. So, I mean it’s technically very difficult to get there and you don’t get the answers overnight. You have to generate ways to look at it, or assays, you have to generate reagents, you have to purify components—typically this has to be done in a cold room because proteins or enzymes are very sensitive and they don’t—you know, they don’t last in an active form very long, you have to keep things—you have to work very carefully and precisely. AA: Were you working in a literal cold room? AK: Yeah, certainly I did a lot of work in the cold room. You put a coat on and, you don’t have to stay there for hours on end but you go in and out constantly. So it is very, very labor intensive. And it’s kind of an art, I would say. But at the end of this exercise, which can take weeks or months or years, you may purify a component. You start with an extract that has thousands of proteins and you manage to get a pure component where you’re able to say here there’s only one protein. And that really is required, because if I don’t add it to this reaction, splicing doesn’t happen. So we did that, and then the first postdoc who I hired here was a Japanese fellow Akila Mayeda—it was his turn to go into the cold room. — Mayeda, that postdoctoral fellow, purified a protein that’s called a splicing repressor. And so for example, for certain exons, if they can be excluded or skipped during splicing, when that factor is present at higher levels, that exon will tend to be skipped. BS: Why would the cell want to repress the splicing of a certain exon? I thought those are the parts that are supposed to be expressed. AA: They are. So this is the really ingenious part of splicing. Those exons, the expressed bits? They are what provide the instructions for building different proteins, which are the workhorses of the cell. AA: Yes. There are lots of different kinds that are specialized to do a lot of different jobs. But there is some overlap—some parts of different proteins are the same. So the cell does this clever thing: it uses the instructions in some of the same exons to build different proteins. BS: And it does that by repressing the splicing of certain exons, so they don’t get included in the final message? AA: Exactly. This is one of the reasons that humans can be so complex even though the human genome is not much bigger than that of a fly. AA: It is! Except…mistakes can happen. And one such mistake, a splicing mistake, turns out to prevent these children we’ve been mentioning from living past the age of two. They have a disease called spinal muscular atrophy, or SMA for short. Adrian learned about this at an NIH workshop in 1999. AA: And so atrophy is when—? AK: Well the muscle ceases to function and then it just disappears, essentially. And then although this can take a long time, so over time the patients lose their ability to move their extremities and they also have trouble breathing because the diaphragm and the rib muscles are necessary to move the rib cage to breathe, and holding the head is difficult. AK: In ’99 there was a workshop at the NIH. And the work in the field in that time had shown that—so there are two genes involved in SMA. The genes are called SMN for survival of motor neuron, but there is SMN1 and SMN2. And they knew by then that the SMN1 gene is the most important gene and in patients it’s missing or it’s mutated to the point that it’s nonfunctional. And in that situation, the SMN2 gene becomes essential. AA: So they make the same thing, these two genes? AK: Yeah, I’ll get to that. So in patients they are strictly dependent on SMN2 to make this protein that is essential for life, SMN. So it is essential for motor neuron survival, as the name implies. Now, the SMN2 gene is not as good or as potent a gene as SMN1 and this has to do with splicing. And that’s what I learned about in 1999 when I went to that workshop. So there is a number of exons, and exon 7, instead of being included in RNA splicing of the SMN2 gene, it tends to be skipped. AK: Different splices and what are the sequences they recognize and what are some of those key ingredients that do that selection. AK: Yeah, spliced forms and a gene that’s not fully functional, has a nucleotide change within the exon, and that seems to be determining for the exon not to be recognized efficiently. AA: So did you realize that right away? While you were at the conference, did you have the thought? AK: I said that it was very interesting and I told people that we were studying something very similar, and that I don’t know anything about this disease, but I probably should just start maybe studying in this area and see what we can contribute. AA: All of that basic research that Adrian and his team did, all of those hours spent in the cold room—that gave them the basic understanding of splicing that they needed to figure out how to correct the splicing error that gives rise to SMA. They came up with an idea for a drug, which they later developed with a company called Ionis Pharmaceuticals. The drug prevents the skipping of exon number 7 that makes SMN2 protein inadequate. The drug is called Nusinersen, and it’s the first of its kind: no existing drug works by fixing a splicing error. BS: We’re going to save the details of how the drug works for a later episode. We’ll do that show once the drug makes its way through the FDA. It will hopefully be approved, but there is some good news right now. AA: This past August, Ionis ended a Phase III trial in infants early because the results were so positive. AK: Just looking at the patients who have received drug for variable period of time and looking at how they’ve done, particularly in reaching developmental milestones, like sitting, rolling, holding the head, even being able to walk, I mean these are very young—and in this trial, infants enrolled as early as six weeks of age, and older. So there was already striking or statistically significant differences between the treatment and the control groups, and therefore they felt you couldn’t continue the trial to completion. AA: Does that happen a lot? AK: No (laughs), not usually. I mean, things have to be very clear cut. AA: What was it like to see that for the first time? You know, this thing that started out with you mixing things in a test tube. AK: Oh, it’s an amazing path, and from what I gather, it’s not one that one can expect to see many times in one’s career. I go to a couple of SMA meetings every year and I meet patients and clinicians and their families and so I understand the impact and the need and—you know, it was always very motivating to come back to these meetings. I still view that what we do is very basic science, but then it has immediate, or a very strong impact on health. It’s very rewarding, let’s just say. AA: So I mean, you said that this kind of thing doesn’t exactly happen all the time in a scientific career, or it doesn’t happen at all. So what kind of advice do you have for young scientists, especially basic scientists? AK: I’ve found it very rewarding to work at the interface of the basic science and the direct applications. We didn’t necessarily set out to come up with a cure for something, we didn’t feel like we were in a position to do that, but in the process of doing the work, you know, then opportunities arise. — When this work started I only had a minimal understanding of what a motor neuron was. But I think that’s an exciting part of science—when you’re following what you have a passion for, it forces you to learn different things along the way, depending on where the science takes you. AA: Learning about Adrian’s amazing career has really made me think about how important it is to support young scientists and help them pursue their passions. 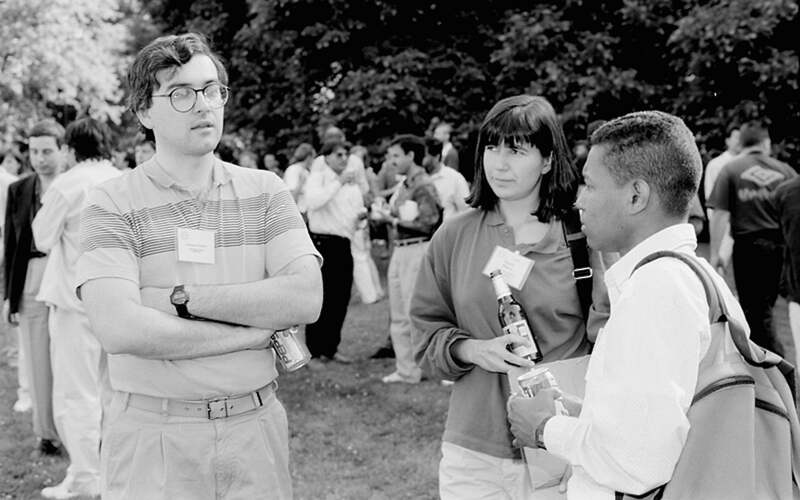 After all, if Adrian hadn’t gotten the Fellow position at CSHL, there’s a good chance that he would have ended up studying something else instead of continuing to study splicing. And then who knows if there would be Nusinersen? BS: Wow. Yeah, I can only imagine how the families of the children in those clinical trials feel about that. But I know for a fact how one important person feels about it. CSHL’s president, Bruce Stillman, feels very strongly about supporting young scientists. BStill: One of the reasons why Cold Spring Harbor Laboratory is really so successful is that we spend a lot of time and effort investing in the careers of young people. This was the case with Adrian Krainer, who came as a Cold Spring Harbor Fellow in 1986, and the Cold Spring Harbor Fellows program has been incredibly successful. Another Fellow, Carol Greider, went on to win the Nobel Prize for medicinal physiology in 2009. By investing in the careers of young people, allowing them and giving them the resources to do really whatever they want, can really lead to profound discoveries. Both in basic science, and as you’ve seen with Adrian Krainer’s work, in the clinic. AA: So, here’s to young people—the young scientists, and the very young people in that clinical trial, who will hopefully continue to benefit from these profound discoveries on splicing. BS: And to many more profound discoveries. Spinal muscular atrophy (SMA) arises from an error in a curious, but fundamental process called RNA splicing. The video below is all about how that process works. RNA splicing goes awry in patients with SMA. The video (below) explains what goes wrong, and how a new drug known as nusinersen—which research from Adrian Krainer’s lab was key in developing—may help reverse the disease’s symptoms. 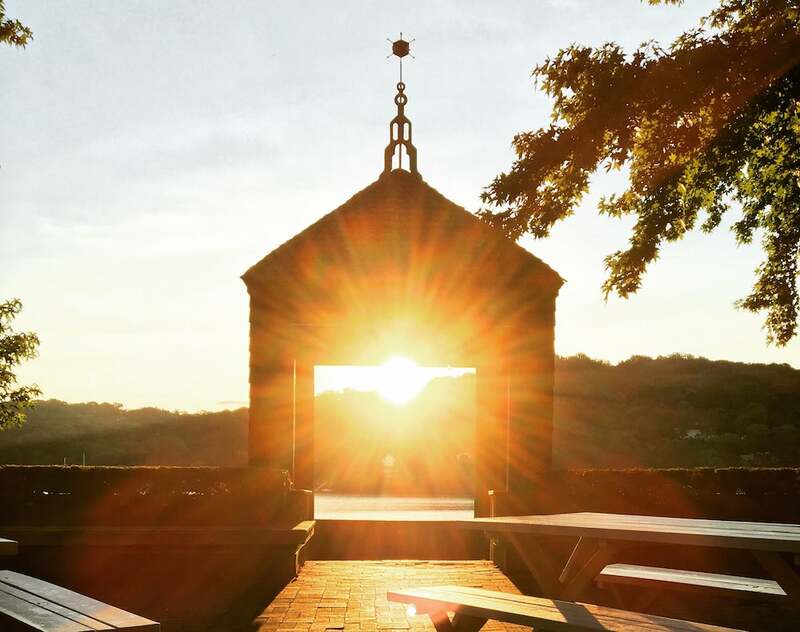 One of the co-discoverers of RNA splicing, Richard Roberts, actually worked at CSHL for a number of years, and later won a Nobel Prize for this discovery—a discovery made possible by the cold-causing virus whose likeness adorns this gazebo on campus (see photo below). LabDish recently talked with Roberts about how the discovery of RNA splicing came about.